Habit: Perennial herb 40--80 cm; rhizome stout, creeping. Leaf: sheath appendages obscure; blade generally 5--14 mm wide, flat, with edge toward stem, curved, crosswalls generally incomplete, tip long. Inflorescence: lowest bract < 1/2 inflorescence; clusters many, 3--10-flowered. 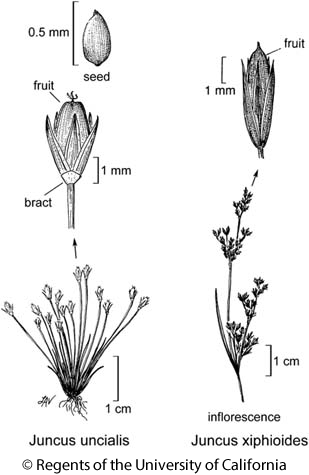 Flower: perianth parts 2.5--4 mm, narrow, revealing fruit between, green to +- red; stamens generally 6, filaments < to > inconspicuous anthers; style 0.4--0.9 mm. Fruit: >= perianth, oblong, abruptly (gradually) tapered to beak. Seed: 0.45--0.6 mm; appendages minute. Chromosomes: 2n=40. Citation for this treatment: Peter F. Zika 2015, Juncus xiphioides, in Jepson Flora Project (eds.) Jepson eFlora, Revision 3, http://ucjeps.berkeley.edu/eflora/eflora_display.php?tid=29743, accessed on April 19, 2019. NCo, NCoR, SN, GV, CW, SW, W&I, D; Markers link to CCH specimen records. Yellow markers indicate records that may provide evidence for eFlora range revision or may have georeferencing or identification issues. Purple markers indicate specimens collected from a garden, greenhouse, or other non-wild location.